On Tuesday morning, Beijing will become a ghost town for three days: Schools will be closed, millions of cars will be absent from roads, and factories will shut down. That's all thanks to dangerous smog conditions that have prompted officials to declare a red alert for the first time ever. In 2013, China's capital adopted a four-tiered system to categorize dangerous smog levels. 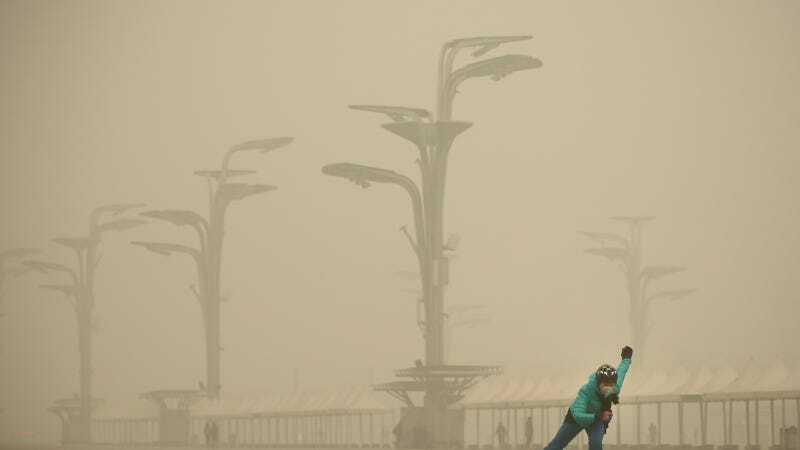 Yu Jianhua, an official who works for Beijing's Environmental Protection Bureau, told China's official news agency Xinhua at the time: "We have made it very clear that when the second highest orange alert is issued, major polluters will have to stop production. We also have regulations to restrict the cars running on streets by the odd-and-even license plate rule." A red alert yields even more severe restrictions: Per Xinhua, "when there is heavy pollution for three consecutive days, the highest red alert will be issued. Kindergartens, primary and middle schools will then have to stop classes. And 80 percent of government-owned cars must be taken off the roads." Ma Jun, director of Beijing's Institute of Public an Environmental Affairs, told the Guardian that the decision to call a red alert is historic. "This is a precedent set,” he said, adding "This is extremely important to stop children from being exposed to such a high level of pollution.” But, Ma Jun stressed, it won't be easy to shut Beijing down. "It is going to involve some very challenging actions like stopping half of the cars. In a city with more than five million cars you can imagine that is going to be a big challenge." The Associated Press explains that to determine how much smog is too much, China keeps an eye on dangerous particles called PM2.5. Our Environmental Protection Agency explains that "Particles less than 2.5 micrometers in diameter (PM2.5) are referred to as 'fine' particles and are believed to pose the greatest health risks. Because of their small size (approximately 1/30th the average width of a human hair), fine particles can lodge deeply into the lungs." Per the BBC, the U.S. Embassy's air pollution monitor showed that PM2.5 levels were 10 times above the healthy limit on Monday. Xinhua says that the pollution, which kills thousands of Chinese residents a day, is caused largely by the country's many coal-fired plants, which Greenpeace refers to as part of a "coal power bubble." Sounds like this won't be the last red alert for Beijing.